Everyone has their favorite brownie recipe. We have tried many different ones but continually come back to the Baker’s one-bowl brownie recipe. This may come as a surprise, because we normally prefer recipes from Cook’s Illustrated or Bon Appetit- certainly not an affiliate of Kraft Foods! But hey, they knew what they were doing when they made this recipe. The number of times we (or our mom) have made this recipe is countless, and every time the brownies turn out perfectly fudgy and delicious! The top is always nice and crackly. They really have the ideal brownie texture. Plus, these are ridiculously easy. One bowl, no special ingredients like chocolate imported from Switzerland- just plain and simple delicious brownies that you are your whole family will love. That’s what we call a great recipe! Melt butter and chocolate together in a medium-sized pot. Stir in sugar. Blend in eggs and vanilla. Add flour and mix well. Pour in prepared pan. Bake 30-35 minutes or until a toothpick inserted into the center comes out with fudgy crumbs (don’t overbake!). 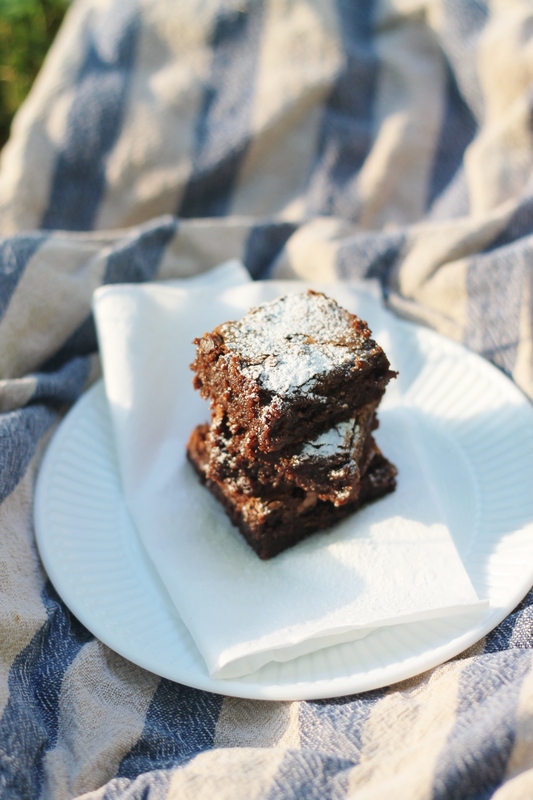 Allow to cool, and then cut brownies and serve. Enjoy! Side note: We have added other things to these before. White chocolate, peppermint bark, toffee bits, peanut butter cups/chips, caramel bits and chopped Milky Way bars are all great additions!